May be it’s the captivating history or their splendour or their stunning architecture, castles still remains one of the greatest tourist destinations throughout the world. These are some of the world’s most incredible castles that seem straight out of a fairy tale. Blue forest fairy tale Castle is situated in an enchanted Tree house Hideaway. This enchanted tree house hideaway may look like elves or princess might emerge at any moment, but it was actually built for human inhabitants to enjoy. Designed by Blue forest the elevated home is located at a secret location in U.K that looks a lot like a fairy tale forest. Blue forest designs all kinds of unique tree houses customized to meet their client’s wildest dreams. Neuschwanstein Castle Germany: the fantasy castle about which other fantasy castle are fantasies, this elaborate slice of Romanesque Revival perches on a hilltop above the village of Hohenschwangau in Southern Germany. Neuschwanstein has become the blueprint for such wildly flamboyant structures. It was the inspiration for the Sleeping beauty Castles which lights up Disney land in California. Alcazar is one of Spain’s most famous castles, rising out of a rocky crag of the rivers Eresma and Clamores. The Alcazar was originally built as an Arab fort but has served as a royal palace, a prison, a Royal Artillery college and a military academy. Chateau Chambord, Loir-et-cher is one of France’s renaissance architecture. The chateau Chambord was constructed in 16th century and has remained relatively unchanged. Walt Disney used it as an inspiration for the Beast’s castle in Beauty and the Beast. Pena Palace, Sintra, Portugal: this colourful palace is a prime example of 19th century. Romanticism in architecture features Moorish influences. Pena was built by King Ferdinand the II who wanted the palace to be visible from the beautiful park. Lacko Castle Lidkoping Sweden: on the shores of Sweden’s largest lake –Lake Vanern-Lacko castle was built in the Baroque style. Visitors should check for concerts and exhibitions that are held there throughout the year. Burg Eltz Germany: it is tucked into a lush valley. Burg Eltz is one of the greatest fairy tale castles in the whole world. Burg Eltz is only one of 3 castles in the Rhine River from Medieval times that hasn’t been destroyed or re built over time. Hiking lets you truly feel the seclusions of this fairytale castle and helps make your first glance a pure medieval fantasy. Mont St Michel the sacred castle in the sea is considered one of the wonders of the Western World. 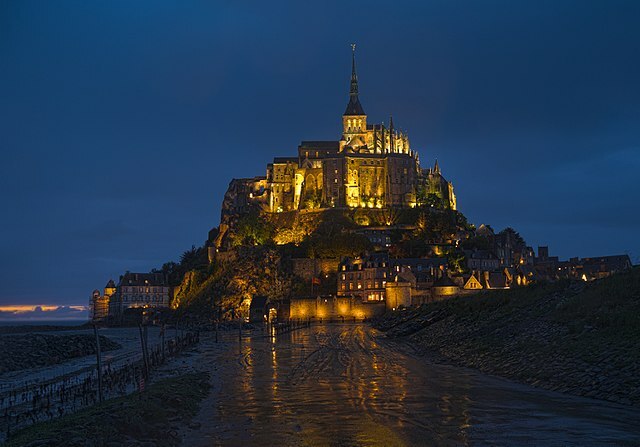 Mont St Michel is a medieval fortress in France, sitting on top of a rocky island in the ocean, floating like a mirage on the horizon this sacred monastery is truly a beautiful site. The centrepiece of Mont St Michel is its church which is essentially a medieval skyscraper which was inspired by a dream. Mont-Saint-Michel is a granite Island in the center of a huge bay connected by a cause to the mainland. During high tide the castle is surrounded by water. The water rushes at an incredible speed and rises up to 45 feet high during high tide. Glamis Castle Scotland is a living, breathing monument to Scottish heritage hospitality and enjoyment for all. It is a family home of the Earls of Strathmore and Kinghorne. Glamis Castle is the legendry setting for Shakespeare’s Macbeth, the childhood home of HM Queen Elizabeth, the Queen Mother and the birthplace of Princess Margaret. The garden surrounding Glamis Castle is beautiful all year round. At Glamis you have the opportunity to see a wide variety of flora and fauna. So enchanting is the beauty of the castle that once you visit, it’ll overwhelm you and tempt you into seeing more.